Angie | ♥ yourapplepie : Where to experience Halloween for free in Singapore ? 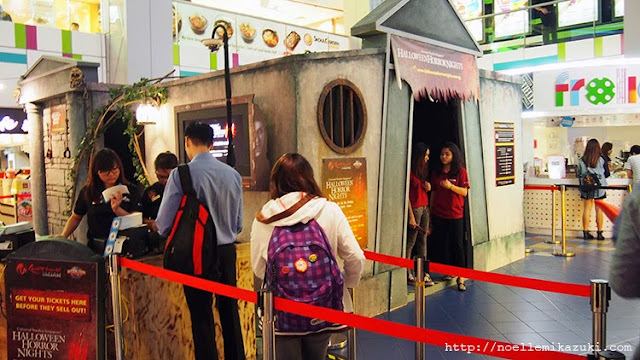 Where to experience Halloween for free in Singapore ? WHERE TO GET A FREE THRILL OF HALLOWEEN IN SINGAPORE. I'm sure you have read my entry about the Halloween Horror Nights 3, but nothing is better than having a feel of it for yourself. Afterall, it's over $60, a lot of money lei. Thanks for the collaboration between Universal Studios Singapore and Cathay Cineleisure, get a free thrill by them when you pop up Cathay Cineleisure Basement one. Actually I think it is quite a good way to impress your timid girl friends. #boystakenote. Well I call that a #cheapthrill, free and get the trick of what might be happening in one of the haunted houses in Universal Studios! It is a minute or two's walk, I suggest you go before dinner. I went there alone and I was quite scared... #cowardcells. In fact, I got a little dizzy even though it was quite short. I'm not telling you much about what's in the house, not gonna spoil the fun. Up for it and ready for more? You can make your purchase for the Halloween Horror Night USS there too. To avoid disappointment, do note down the dates for the cheapthrill. Fridays to Sundays - 12pm to 9 pm. I hope you have fun and not see things. *wink.